"An elite police squad hunts a manipulative mastermind out to publicly execute criminals the law cannot reach. A wild thriller and deadly game of cat-and-mouse from one of China's most popular authors. For fans of Jo Nesbo, Se7en, and Hong Kong police cinema. The brutal murder of respected police officer Sergeant Zheng Haoming sends shockwaves through Chengdu, a modern metropolis in the heart of China's stunning Sichuan Province. He had been obsessed by an unsolved, eighteen-year-old murder case, until an entity calling themselves Eumenides (after the Greek goddess of vengeance and retribution) releases a terrifying manifesto. Is the manifesto a sick joke, or something more sinister? Soon, the public starts 'nominating' worthy targets for Eumenides to kill, and two days later, Sergeant Zheng is dead. Eumenides' cunning game is only getting started. The police receive a "death notice," a chilling note announcing the killer's next target, the crimes they have committed, and the date of their execution. The note is both a challenge and a taunt to the police. When the first victim dies in public, under their complete protection, the police are left stunned. More death notices are coming. The chase is on. 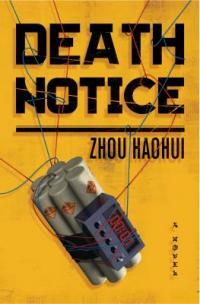 Death Notice is an explosive, page-turning thriller filtered through a vibrant cultural lens. Zhou Haohui expertly adds an exhilarating new perspective to the twists and tropes of the genre all fans love, making for a uniquely propulsive and entertaining read"-- Provided by publisher. "An elite police squad hunts a manipulative mastermind out to publically execute criminals the law cannot reach"-- Provided by publisher.